I'm still sewing away on my Top Secret project, which means I don't have much to share at the moment. Kinda frustrating to tell the truth. 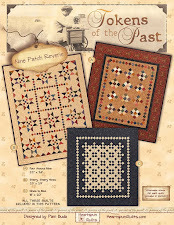 I think I will be able to show major progress on my new pattern, Plantation Stars next week which will be fun. But for now....I wanted to share something you might enjoy as much as I do. 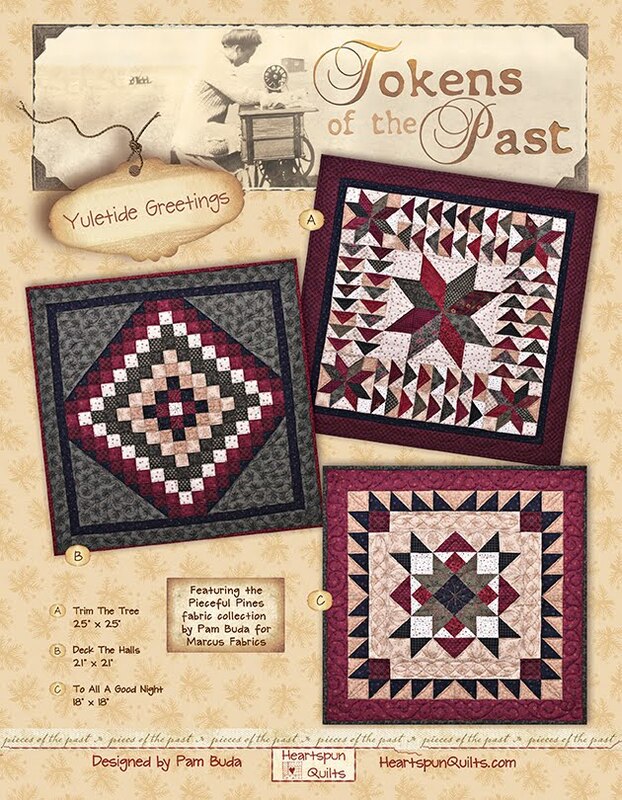 I'm watching this series on Netflix while I sew and enjoy it immensely. 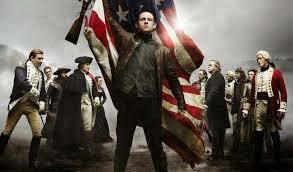 It takes place in New York (and all around the Colonies) in 1776, and is about a cabbage farmer who becomes a spy for General George Washington and the Continental Army. 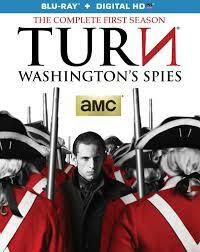 The British, of course, are everywhere, even lodging in your home, so the rebels and spies must work in secret getting news about the British to the General. While the story has a whole lot to do with the revolution, we do get to enjoy scenes of ordinary life during that time. 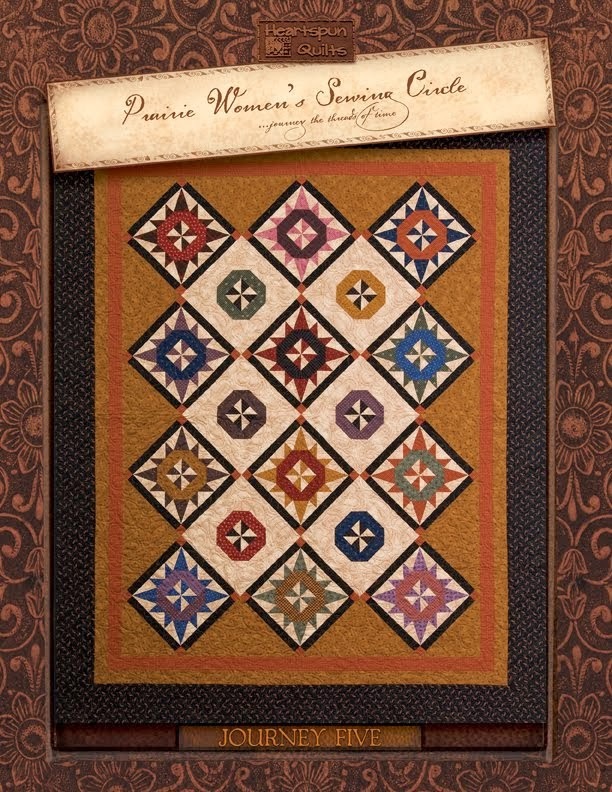 In a recent episode, I was happy to see women quilting around a large frame, and another at the spinning wheel. The series has 3 seasons already done and ready to watch, which means it's likely a whole lot of you already enjoy it. I just thought I'd put it out there in case some of you haven't heard of it before. 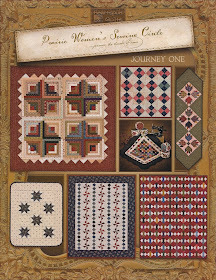 Several years ago, I was visiting with the staff of American Patchwork & Quilting magazine for an event. Let me say, these are fun people to hang out with, and we always have a great time together. For one of the lunches, they catered a variety of salads from a local restaurant. (Let me tell you, Des Moines, IA has great restaurants!!) Among the salad offerings was the salad below for which I honestly could not get enough!! I made a note of what was in it, and once home, began to try to copy the recipe. It's simple enough and I was successful on the second try. My family loves it!! It's really a summery twist on a classic chicken Caesar salad as it has fresh strawberries, pasta and walnuts. You may not think this is a great combo, but you'd be wrong! If you like Caesar salad, you will LOVE THIS! It's very easy to make and keeps in the fridge a couple of days. Simple and refreshing. Click here for the Summertime Caesar Salad recipe. The recipe makes about 6 servings but you can easily make it larger or smaller depending on your wish. I hope you enjoy it! I'm having some leftovers from last nights dinner tonight which means I can sew a little longer today. My July projects are coming along nicely. 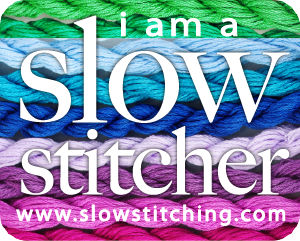 Hope you are stitching a fun summertime project or two. For me, the accuracy of your 1/4 inch seam is all based on alignment. 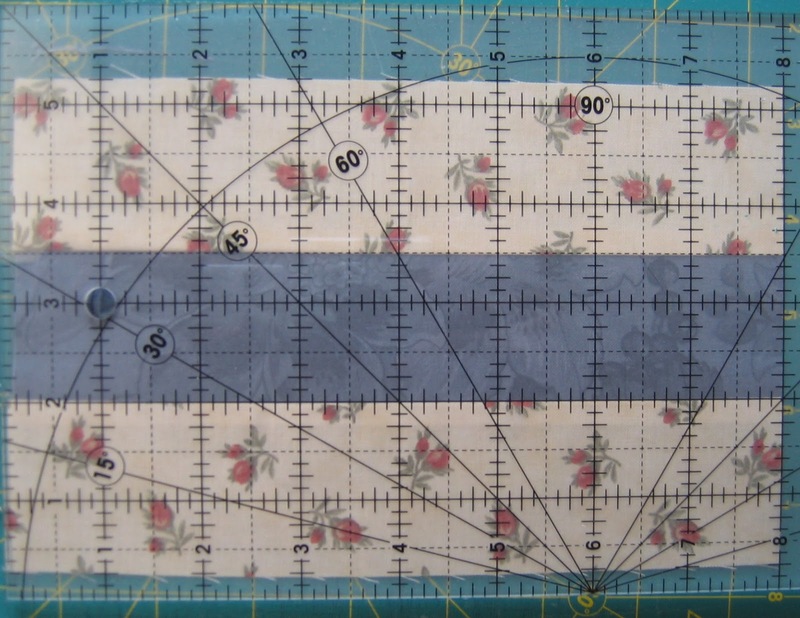 It's all about where you align your fabric in conjunction to the needle. It's as simple as that! Let me explain. Think of the needle as center position. 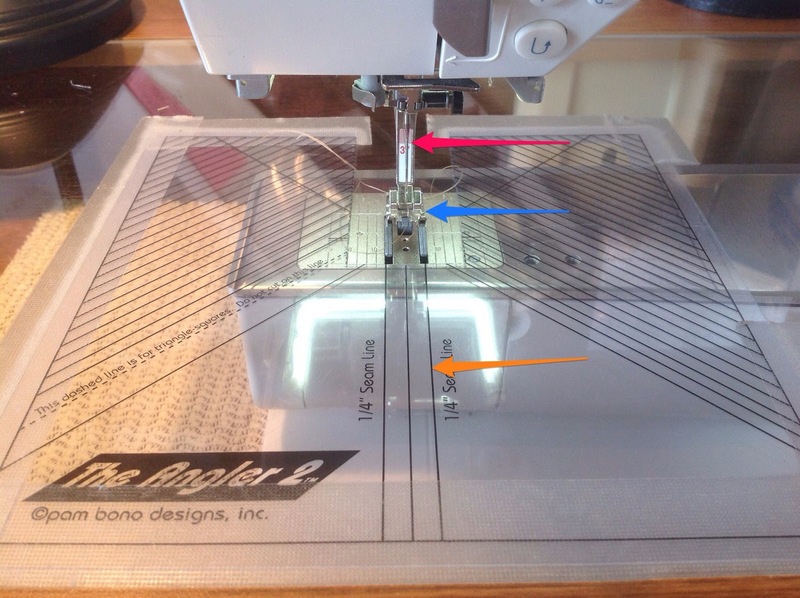 Where you align your fabric, meaning what line or guide you follow as you push the fabric to the needle, must be exactly 1/4 inch to the right of the needle. Does that make sense? The pink arrow shows the needle in center position. The blue arrow shows the right side of my 1/4 inch foot (which means the edge is 1/4 of an inch to the right of the needle), and the orange arrow shows my alignment line...which is where I line up my fabric to sew. Notice that the right edge of my 1/4 inch foot and my alignment line are in perfect alignment with each other. What do you use as an alignment guide when you piece? Is it a template like mine? A Post-It Note? A piece of tape or other guide? Do you move your needle right or left? An important element is helping my 1/4 inch success. It's a large, flat surface surrounding my machine. At home my machine sits in a table, but when I travel to a retreat, I have several options with portable tables. In my (humble) opinion, it is very important to have as large a surface as possible surrounding your machine to keep your fabric/patchwork/quilt as flat as possible as it approaches the feed dogs and needle. Why? Control! In the photo above, between the two black arrows, I have about 1 inch of space to align my fabric and control its journey to the needle. Not much at all. (With the table and The Angler, I have about 8 inches.) With a small piece of fabric it may not be too bad, but with blocks in a growing top, and borders, there is a lot of drag weighing you down, making it hard to control. With a table surface, it's much easier and you definitely have more control. To sum up....the line or guide where you lay your fabric, and guide it to the needle, makes all the difference in what your seam allowance will measure. The needle should stay in center position and your guide should be exactly 1/4 inch to the right of the needle. Now...there's one more super important step. Checking your 1/4 inch seam for accuracy by putting my alignment principal to the test. Checking for accuracy is very simple. Make a strip set. 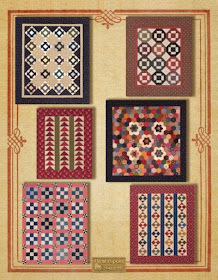 Choose two high contrasting fabrics. Cut (2) 2 x 6 inch strips of one (in this case a light print) and (1) 2 x 6 inch strip of a dark (blue strip above.) Sew them together into a strip set using your alignment marking as a guide. Press to the outside strips. The center strip must measure 1 1/2 inches. Period. By creating a strip set this way, you can lay a ruler on the center strip to check accuracy for the entire length of the strip set. I never recommend checking your seam allowance on the wrong side of your fabric as often you can't tell. With the high contrasting fabrics you can easily see what the center strip measures. 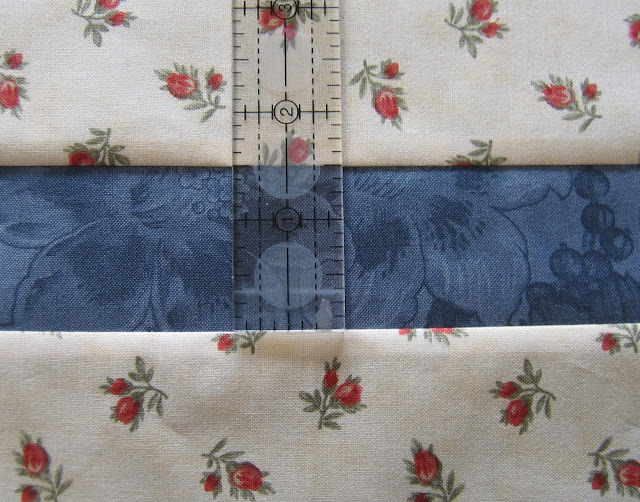 Pressing the two outer strips to the outside creates a ditch so the ruler fits in the seam snugly. You can also monitor how accurately you sew at the beginning and end of a strip - a trouble spot for many quilters. What if your center strip doesn't measure 1 1/2 inches? 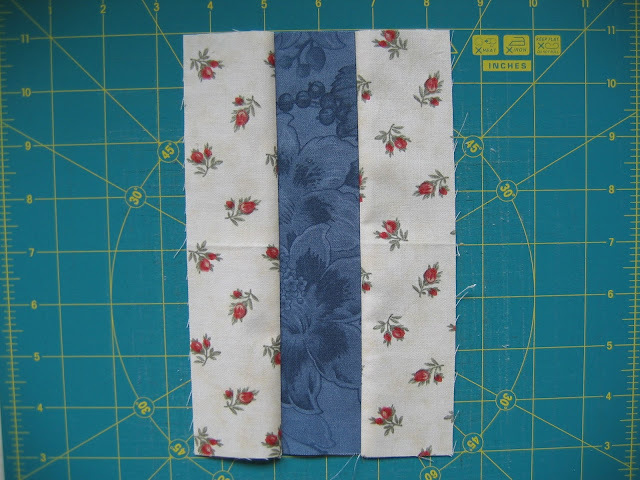 If your center strip is smaller than 1 1/2 inches, then where you align your fabric is too far to the right of your needle, making your seam smaller than it should be. Move your alignment line to the left, and make another strip set to test for accuracy. 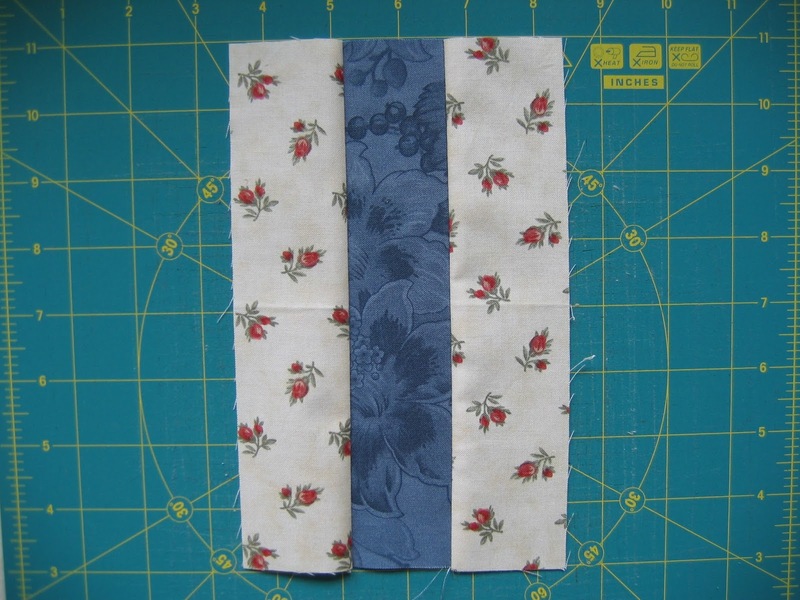 If your center strip is more than 1 1/2 inches, then where you align your fabric is too far to the left of your needle, making your seam larger than it should be. Move your alignment line to the right, and make another strip set to test for accuracy. Once you achieve a perfect center strip of 1 1/2 inches......don't move your alignment line.....EVER! Teehee....or try not to! 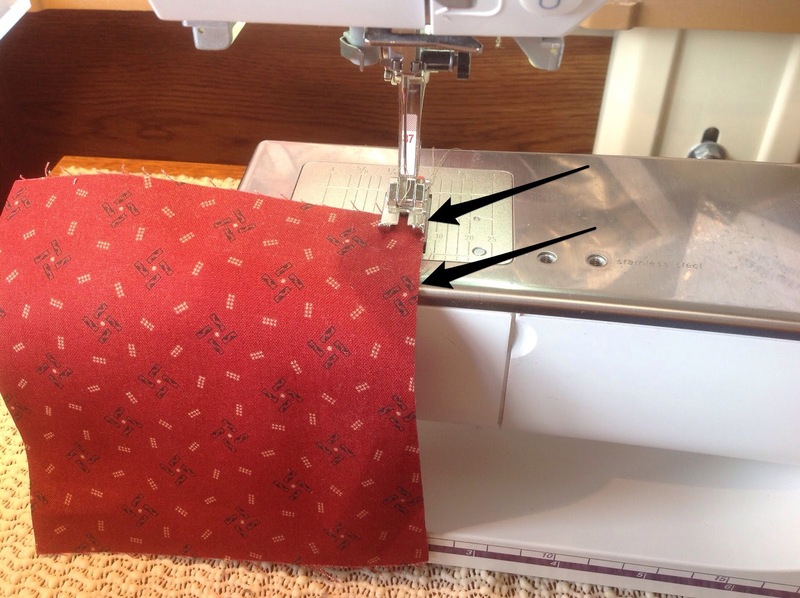 If for some reason you have to move your alignment line, just repeat the steps above to find that sweet spot that is the perfect 1/4 inch seam! I make a strip set every time I get my machine back from having it cleaned. Just to be sure. 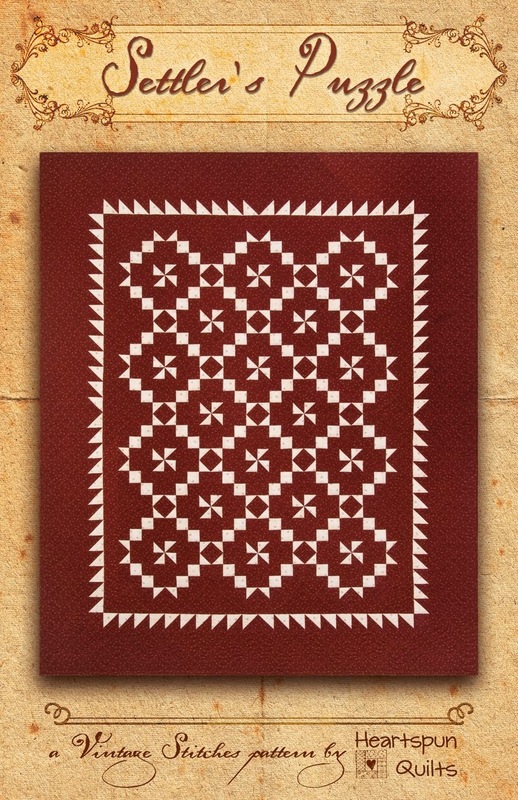 Once you know exactly where to align your fabric for a consistent perfect 1/4 seam, you can make any block in any size and not worry. 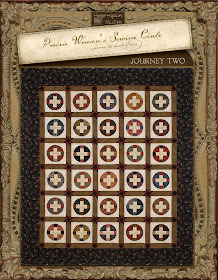 Your entire piecing experience improves because you're happy with your work. It's worth the effort to go through these steps. Keep in mind....these hints and tips are my opinion and what has really worked for me. I don't claim to know everything, and certainly there is always more than one way to do the same task. I sincerely hope that this exercise will help you. FYI - For some unknown reason...Blogger is not publishing my own comments. Often, you leave me a comment and ask me questions or have requests. I try to reply to your comment but it just doesn't publish (frustrating!!) I have no way of responding to you if you are commenting anonymously. I'm trying to figure this out as I want to respond to your comments. Any suggestions for a fix? Be well....go forth and have happy stitches! 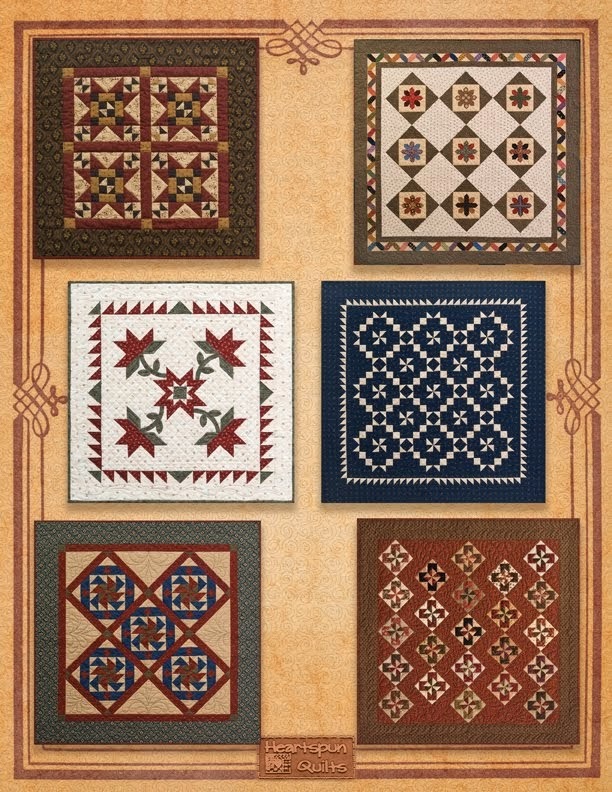 I am a happy quilter! I am sewing and sewing everyday on a new, top secret project that will last the entire month of July. (I am bursting to tell you all about it but I just can't for now. UGH...its hard to keep mum about it!) It's been raining here a lot lately which makes for a cozy atmosphere for sewing. 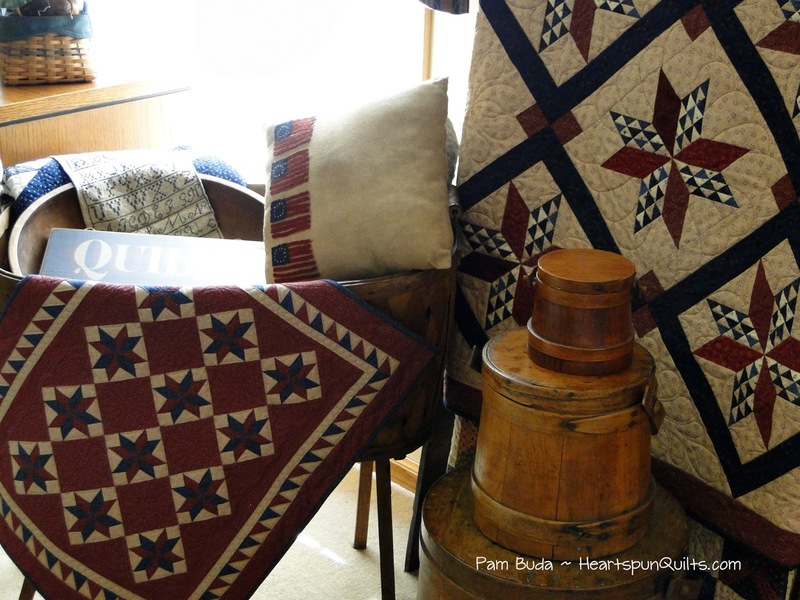 I am so enjoying my patriotic vignettes, and the quilts in the photo above just make me happy. 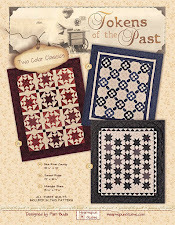 I love them together and I get to enjoy them while stitching in the family room each evening. These little pleasures in life are so wonderful! 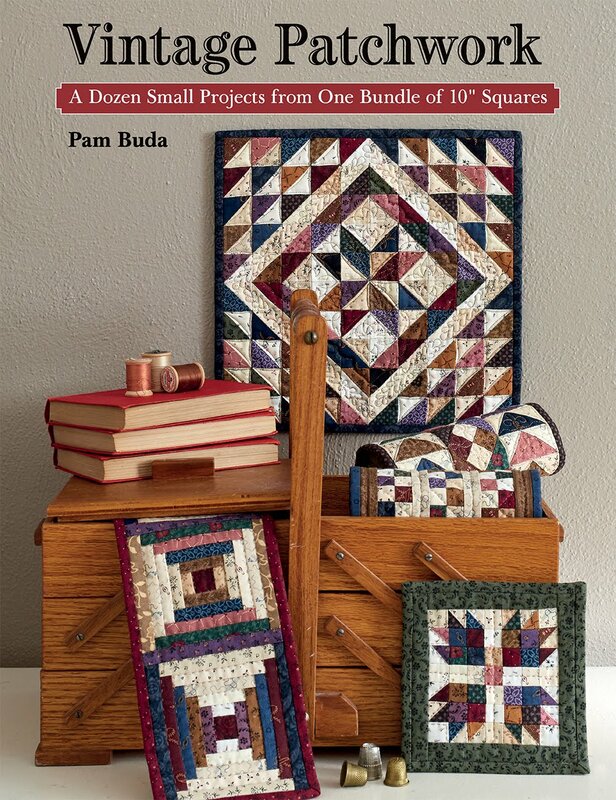 Hosted by Rita Briner and her staff at one of the most awesome quilt shops in the United States, Quilter's Station, this is a not-to-be-missed event. Rita really knows how to throw a party and this last POTM will be one to remember! That's a pretty great line-up, if you ask me!! Primitives of the Midwest begins August 16th. Click here for all the details and to see all the projects. 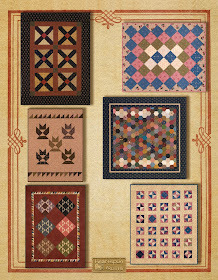 It's going to be a wonderful event, in a great location, with fun instructors and quilters. 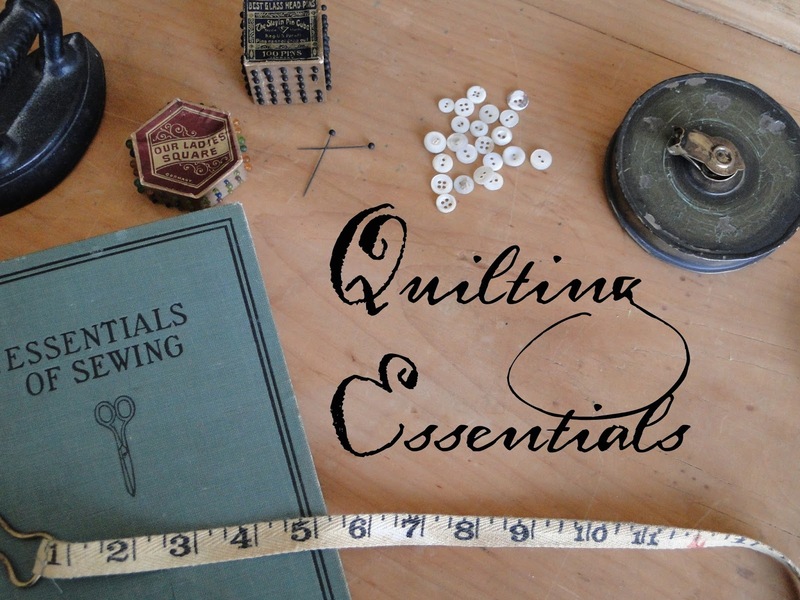 Watch for my next Quilting Essentials post all about achieving an accurate 1/4 seam coming this weekend! My brain has been buzzing with new ideas. A good thing, to be sure, but when will I get to do all the things I'm dreaming of? Never happens to you, you say? Lucky you! I guess we make time for the things that we're most excited about, right? 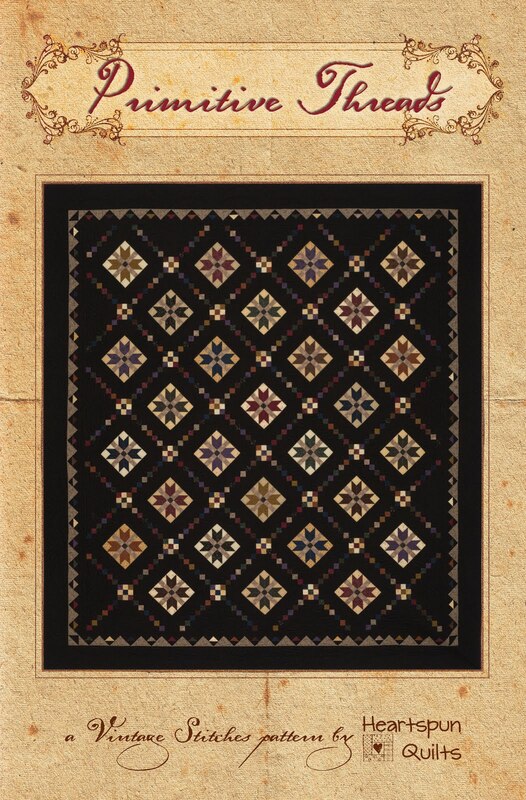 And I'm so, so jazzed about a new quilt all in blues and just one light. 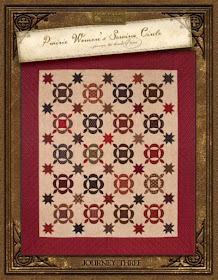 Here are the fabrics I chose and the name of the quilt is Plantation Stars (a little hint to the theme.) There will be a limited number of kits. Hopefully, it will be all done and I can show you in September. 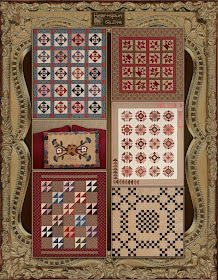 I'm already in fall market design mode, so there will be lots more coming soon. Watch for the next Quilting Essentials post...all about the elusive, accurate 1/4 inch....coming soon! Wishing you all a very Happy 4th of July in celebration of our country's Independence Day! My heartfelt thanks to everyone serving in our armed forces today, and honoring and remembering those who have served, and those who paid the ultimate price so that we could all live in this wonderful country. 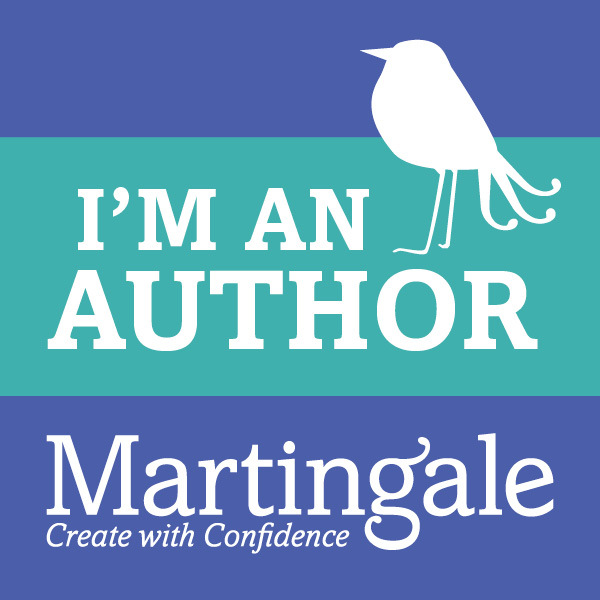 Follow me on Facebook, Instagram and Pinterest for more photos. 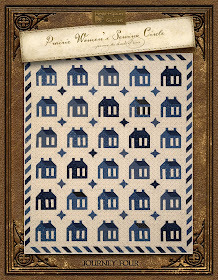 Labels: Pam's Fabric with Marcus Brothers, Tokens of the Past Union Forever!